Aculife-Ireland has studied the most effective points for treating a wide range of medical conditions over a period of several years. Feedback from users now allows us to show the most effective hand Acupoints for treating a wide range of different conditions. The points shown for each condition are shown in groups and in most cases they will be the same points that a user will find sensitive when using Aculife. These recommendations are based on reported user experience from thousands of Aculife users and do not result from formal clinical trials. Needless to say, if you have a medical condition or if you are concerned about the sensitivity shown on your hand by Aculife, do see your medical practitioner. Purchase the Aculife Hand Acupuncture Booklet now to learn about the most effective points for treating 57 different medical conditions. For your convenience we offer both a hard copy and downloadable PDF version of the handbook. Secondly, we have broken the treatment points into three different groups. Each group is identifiable on the handmaps by a different symbol; a green circle or oval; a navy blue rectangle and; an orange triangle. At least one point in each of the displayed categories should be treated for 5 minutes in each treatment session. In reality, the points where a user gets the strongest sensation on the hand will always be the correct points for treatment. 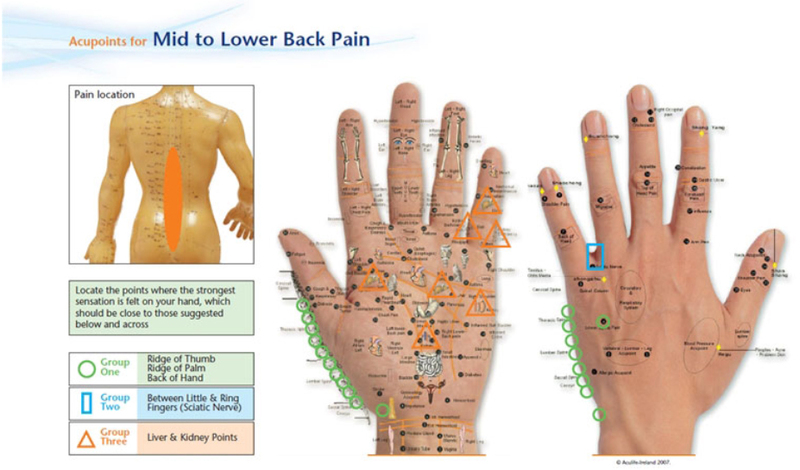 Please note that if you have no pain at the moment, then you will not get a strong sensation on the hand Acupoints. Similarly, after a treatment you should find that the sensitivity in the hand Acupoints should reduce. Also, try to be patient. Aculife is not a quick-fix device that will immediately solve all of your health problems. Rather, it is a treatment that requires systematic use over a period of two to fourteen days to show significant benefits. Based on the thousands of success stories related to us by regular users of Aculife, we believe that perseverance is well worthwhile.